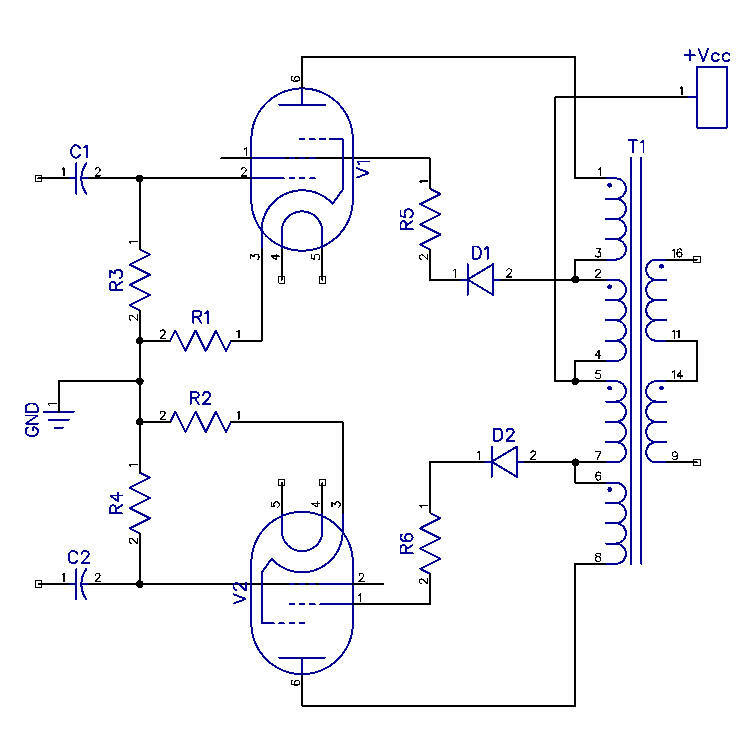 OES example: UL PP: Take a GOOD look at those two silicon diodes … and try to figure it out ! An easily perceptible increase of the output power of your amplifier (without any extra stress on the tubes). A major “cleanup” of the sound. 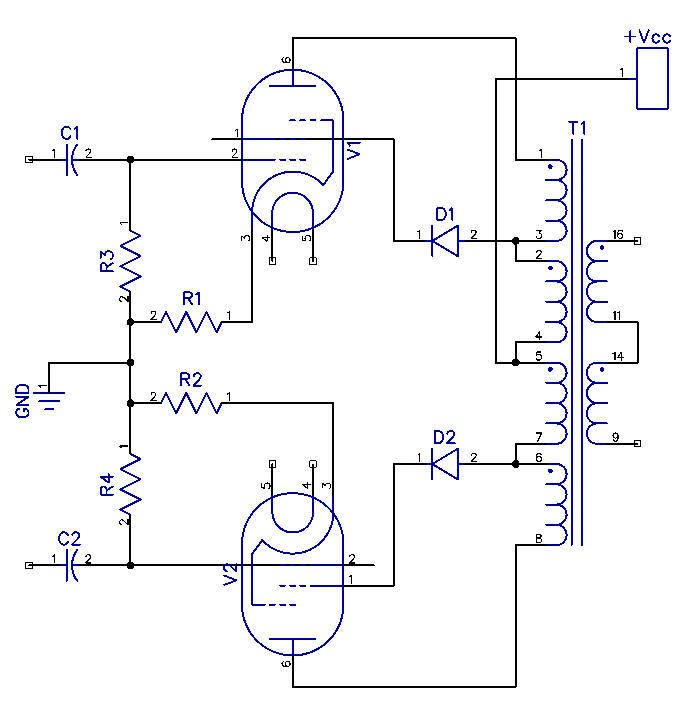 The method, that I will be writing about, will essentially result in converting your Pentode based, or Tetrode based tube amplifier, into something that sounds more like a much preferred “triode sound”. That is what may have come to your minds, well, err …. not quite. Because normally, when you strap a pentode into a triode mode of operation, you basically commit a trade-off: you accept a more natural, triode-like sound, at the expense of less output power (as the triode-strapped pentode will normally provide you with less output power). 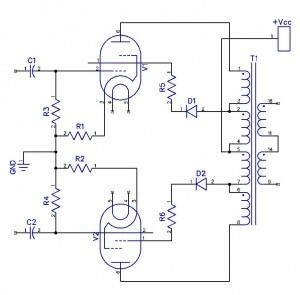 Achieve a “triode” like sound, but with much more detail and clarity in the listening experience, and at the same time achieve a significant increase (not decrease) of output power ? An increase in comparison to the “Pentode output Power” ( as opposed to the “triode-strapped-pentode” power). Sounds nice, does it not ? I used the word “trivial” – but that ‘term’ needs a major explanation: “Trivial” – is the task of modifying your amplifier in order to achieve the aforementioned described results. The whole procedure would involve your solder iron to add no more than 4 elements within a UL PP amplifier, or maybe even just two in the case of (some) UL SE amplifiers. … refer to my OES – Optimized Electron Stream © Technology designs and web pages in any way you wish but please remember the design concept is copyrighted in the manner described on my website. What that means in practice is that you are free to use the design in all or any of its forms for DIY projects but not for any commercial purpose whatsoever. Commercial usage requires a formal license and payment of royalties etc. But be warned: The text refers to the results and experiences gained during a period of 50 years of research and experimentation, as mentioned above. OK, some of you may give this text a try (just as I did), and maybe some of you will grasp the specifics of the workings of this solution ( just as I did, .. “sort of” ). But I am currently digging into the subject. What I will try to do in the nearest future, is try to provide you with a simplified, or “general understanding” of what I believe to be happening after applying such a modification and applying those magical silicon diodes in your amplifier, with the kind patience and support from the “primary source” of the solution. I have already obtained some extra explanations, so I will dig into the source text once more, and will hopefully come back to you shortly with a layman’s view relating to: “What the hell is going on and why does it SOUND so GOOD !!”. Best way to confirm the concept is to try it. You do not have to change any circuit values or components or voltages. You might just be amazed at the improvement in clarity of sound – which is one of your goals. The primary benefits of the Optimized Ultra Linear © Technology diode configuration is that you get the power of a pentode with the purity of a triode. However the tonal or sonic characteristic is bright and clean – unlike the less defined “muddy” triode sound. if you do not like it just revert back to what you had. Attention: Some types of output stage topologies, using the Ultra-Linear taps of the transformer, foresee a Screen Grid stopper resistor between the UL taps and the screen grid. In such circumstance, please ADD the diode in series with the resistor, rather than replacing it. 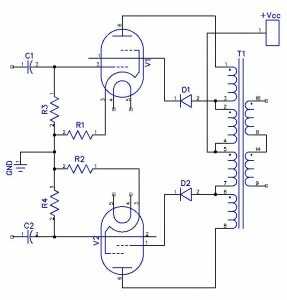 The resistor should remain within the circuit.